Cairo: Nobel laureate Mohamed ElBaradei, who recently quit as Egypt’s interim vice president and left the country in the face of deadly crackdown on the Muslim Brotherhood supporters by military-led government, may face charges of “breaching national trust” in a court in Cairo. The Nasr City misdemeanour court today decided that on September 19 it will consider the case filed against ElBaradei for “betraying” the public by resigning on August 14, a charge that could carry an 1,430 dollars fine if he is convicted. 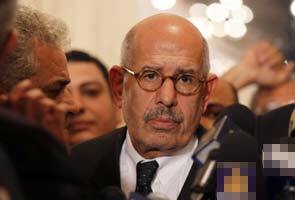 The case, filed by Sayed Ateeq, head of the Criminal Law Department at Helwan University’s Faculty of Law, charges 71-year-old ElBaradei with breach of “national trust”, state-run Al-Ahram Online reported. According to Ateeq, ElBaradei had not presented to the government, the presidency or the revolutionary forces any other alternatives to dispersing the sit-ins, as well as disregarded the “terrorist crimes” committed by Brotherhood. He charged that ElBaradei’s resignation created an impression to the global community that the Egyptian government used excessive force in dispersing the sit-ins by Brotherhood supporters who have been protesting against ouster of Islamist president Mohamed Morsi on July 3 by the army. “ElBaradei was not selected as vice president for his person, but as a representative of the National Salvation Front and revolutionary forces,” and that he had resigned without consulting with those he represented, Ateeq said. ElBaradei, a former chief of International Atomic Energy Agency, is currently in Austria with his family after leaving Egypt last week.